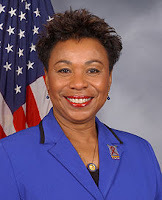 I am pleased to announce that U.S. Rep. Barbara Lee (D-California) (below left), Chairperson of the Congressional Black Caucus, will chair the Second United Nations Forum on Minority Issues, undertaken in accordance with Human Rights Council Resolution 6/15 (2007). Yours truly has organized and convened the forum as part of my duties as the U.N. Independent Expert on Minority Issues, about which I've posted here. Theme for this forum is "Minorities and Effective Political Participation"; it will take place November 11-13, 2009, at the Palais des Nations in Geneva, Switzerland. ► initiatives and solutions for improved and more effective political participation by members of minority groups. In addition to a wide range of stakeholders, the Forum will bring together members of minority populations from all regions of the world, who are either elected officials or have been candidates at national or local levels, those engaged in political parties, and those who are actively engaged in developing programs to encourage greater participation of minorities in the political process. There will also be a number of minorities who are senior government officials from countries that have affirmative action policies or constitutional provisions that require diversity in the top echelons of government. It is hoped that they will be able to share their personal experiences and to make proposals for policies that would encourage greater participation of minority groups in political processes. Additionally, the Forum participants will include governments, relevant bodies and specialized agencies of the United Nations, intergovernmental organizations, regional organizations, national human rights institutions, experts on minority issues and non-governmental organizations. As last year, it is anticipated that there will be over 400 participants. The forum will produce action-oriented recommendations, addressed to governments, political parties and nongovernmental organizations, which I will present to the Human Rights Council next spring. For information, please contact the Secretariat supporting the forum, Lydie Ventre, lventre@ohchr.org, or Kim Turcotte, minorityforum@ohchr.org. Further details here.